Before we dive into what it takes to create an irresistible offer, I just want to make sure we’re all on the same page by defining the concept of an irresistible offer. An irresistible offer is simply a strategic structuring of your products and/or services where the value-to-cost ratio is value-heavy. Meaning that the value of your offer FAR exceeds the cost to access the value. So much so, that when your ideal customer came across your offer, they would say to themselves “WOW, this is an absolute “no-brainer”, I MUST buy this right now!”. The offer is so good, they can’t say “no”, it’s irresistible. Now that we’re 100% on the same page, let’s start talking about how to create they right kind of irresistible offer for you and your business. When most people first think of creating an irresistible offer they automatically think about drastically discounting the price of their product or service. It’s probably because this is the type of marketing promotions we’re most frequently exposed to: coupons, flash-sales, big red “50% off sale” signs, etc. So, since discounting is how most marketing and advertising is done, it makes perfect sense that discounting is the first place our minds go. That being said, “savings-focused” marketing and “irresistible offers” are not one in the same. When you think “great deals”, what is the ONE day out of the entire year, that comes to mind? Businesses discount their products so drastically that people lose their minds – quite literally. They stand in line over night, and are willing to trample people who are also waiting in line 10 people behind them, just in order to save a couple hundred bucks on a flat screen TV. The awesome thing about Black Friday is that it moves people to action, and creates a spike in sales and foot traffic. But, that’s also the downside, it creates a spike. How many people go to Best Buy, or Walmart to purchase a flat screen TV, the next day at full price? Where is that line of people waiting overnight to make a purchase a week later? The point being is that it’s not a sustainable marketing promotion. This is exactly why significantly discounting your product is not the best way to create a true irresistible offer. Yes, it’s true, people love saving money, but more importantly, people are looking to get the most value for their dollar. One of the core pillars of an irresistible offer is that it must be an offer that is sustainable for your business model, and that you can continually sell. It’s important to keep that in mind when creating an irresistible offer for your product or service. An irresistible offer is about making the customer feel like they are getting maximum value for their dollar. 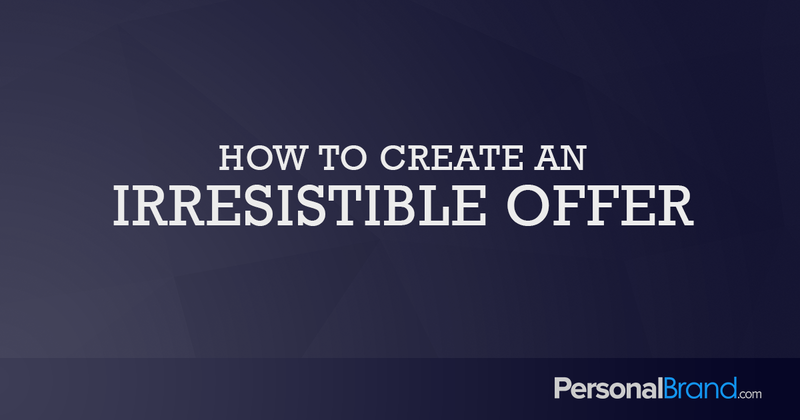 There are many different strategies and methods to creating an irresistible offer. Your irresistible offer should communicate the value of your product or service so clearly that anyone in your target market who is considering making a purchase, believes the value will far surpass the cost. You’ll know you have an irresistible offer when people say something along the lines of, “Wow, only an idiot would pass that up!”, or “I can’t believe it’s only that much… I would have paid twice that much!”. The most effective irresistible offers are the ones that leverage multiple pricing or value strategies. This is often called creating an “offer stack”. A simplified version of an irresistible offer is a good deal stacked on top of another good deal. Let’s dive into each of these topics a little deeper. Creating bundles of your products is a great way to increase the value of your offer and make more sales. Remember, people are looking to get more value for their dollar. If a customer can, for example, get five products for the price of three, this can be an irresistible offer. For example, cell phone companies like Verizon and AT&T do this with new cell phone sales. For only ~$50 more, you can get a car charger, protective phone case, and a package of three screen protectors. The phone case alone is $40, so people run the logic in their mind, and think “well, only an idiot wouldn’t take advantage of THAT deal,” and they pull their credit card. Phone companies use the bundling concept for an up-sell, but you can use it for your core product offering as well. Do you have multiple products or services that you can bundle? Create a handful of offers that you believe would make your customers say to themselves (or out loud), “Wow, you’d have to be an idiot not to buy this right now!” and run them by a few of your loyal customers to get their feedback. Depending on what type of business you have, and goals you are wanting to achieve, there are certain financial metrics that cary more weight than others. The value-add offer model is a great way to continue to charge full price, but you sweeten your normal offer by throwing something in with the sale. Value-adds are exactly like bundle pricing. The difference with value-adds is that your customers get a secondary product or service that increases the real, or perceived, value of the product they are purchasing, at no extra cost. For example, if I sell toothpaste, I could throw in a tooth brush with the purchase of a full-price purchase of a tube of toothpaste. The toothbrush makes the toothpaste more valuable. If you can get creative, there are quite a few ways to add value without having to spend a lot of money or cut into your profit margins. Brendon Burchard’s book launch for his book The Motivation Manifesto debuted at #1 Barnes & Noble and spent dozens of consecutive weeks on the NY Times Bestsellers list, largely because he created a value-add offer with the sale of his book. When you purchased a copy of The Motivation Manifesto, you also received access to a 12-week online training program, that was based on the concepts in the book and valued at $297, for free! This is a perfect example of adding substantial value without affecting your profit margins because the cost of delivering the online course is virtually the same whether he gives the course away to 100 people or 100,000 people. And if you’re looking to buy a personal development book, which one are you going to choose, the one with a free online course, or the one that doesn’t have any value-add? What is something that you can throw in with your product to increase the value of a sale? The goal with a risk-reversal is to take as much risk as possible off of the customer’s shoulders. When you reduce risk, you remove friction from the buying process, and increase the number of sales you make. There are actually several ways that you can take away the majority, if not all the risk so reassure people that they have the opportunity to confirm that their purchase was a quality decision. Unless you’ve been living under a rock, you’re familiar with money-back guarantees. The key here is to make your money-back guarantee stand out. Instead of giving the typical 30-day money-back guarantee. Give your customers a 365-day money-back guarantee. If you have rock-solid confidence in your product or service, give a 90-day double your money-back guarantee. If a customer uses your product correctly, and isn’t 100% satisfied with their purchase you’ll refund them double their money. Wow, talk about a risk reversal! Who wouldn’t take that offer? This concept is usually based on the honor system. I’ve seen Ryan Deiss implement this concept with his live event, Traffic & Conversion Summit in the past. The total price of a ticket to the conference is $1,400 but you only have to pay $700 in order to attend and if you don’t make at least $5,000 within 90 days of the event with what you learn at the event, you don’t have to pay the remaining $700. I’ve also seen some internet marketers use this concept to enroll students into their high-end coaching programs. For example: A year-long program has a price tag of $15k but you only have to pay $10k up front. If you don’t get the results you want, you don’t have to pay the remaining $5,000 balance. This is a way to discount your price, but guarantee results at the same time. If you use this concept, do not bank on receiving any of the extra balance – you probably won’t see any of it. It’s more of a guarantee or a “show of confidence” to enroll people, than it is a payment plan. This is a pretty common concept, but again, make your warranty stand out. Put a rock solid warranty on your product to remove any doubt in a customer’s mind that they are purchasing a quality product. Warranty’s typically only make sense for physical products but they can also be applied to software products too. Payment plans are a great way to reduce risk. It essentially spreads the risk out over a longer period of time. Payment plans, allow your customer to get all, or most, of the benefits of your product today, while minimizing the immediate financial risk. This is a very effective marketing tactic that has been used to boost conversion rates since the stone age… ok well maybe not that long. But, you’ve seen it countless times on TV infomercials. They work! While discounting is the go-to when you think of a sales promotion, it’s not the only option and often isn’t the best option, either. In the first chapter of the book Influence, Robert Cialdini tells a story of a small business owner who was struggling to make sales. He wrote a note to his manager to cut the price of their product in half in hopes that it would sell faster. The manager actually misread the note and ended up doubling the price of the product instead, and the product flew off the shelves. The principle at play here is perceived value. People have a value association with the price of a product, therefore, discounting your product may not generate enough sales volume to offset loss in profit from selling your product at full price. Here are some concepts that make discounting more powerful. Below I’ll share some ways that you can incorporate those concepts into your irresistible offer. A great way to create exclusivity is to create segmented offers. You can segment your offers by channel. For example, you could have a specific offer just for Facebook. Or you can segment your offers to your database based on purchase history. If you have an advanced CRM & email marketing tool like Infusionsoft, this should be a super easy concept to implement. If you’re using a basic email marketing tool like iContact, Aweber, Constant Contact or Mailchimp, it may be a little more difficult. Essentially, you’d create an amazing offer that is only available to people who have purchased your most expensive product or service, or spent a certain amount of money with you over their lifetime. You would segment your customer database and market that amazing offer only to your best customers. This is powerful because you can tailor your messaging to that specific group and make them feel like they are apart of the family. You can also create different offers for people who have purchased any of your product vs. people who are just subscribers to your newsletter. The epitome of an early bird discount is the Black Friday “door buster”. People start to line up hours, even days in advance to be one of the first 100 people to get a flat screen TV for $300. Although it’s fun to joke about how the day after Thanksgiving people go crazy for material possessions, their behavior goes to show that these types of promotions are very effective. This is largely due to the fact that the offer has very strong exclusivity and urgency components. It’s exclusive because only the first 100 people will get that price, and it’s urgent because it’s only available on a single day. Rewarding the early customers with an added bonus, on top of the offer they are already expecting, is a great way to jumpstart and maximize the word-of-mouth marketing that will evolve from your irresistible offer. A discount becomes a limited-time offer when your offer is only available for a short period of time. Instead of just marking down your product and putting it on sale, create a limited-time offer. This creates scarcity and forces people to make a buying decision now, if they want to take advantage of the special offer. Promotions need deadlines for the modern buyer to take action. With these types of offers, most of your results will come within the last 48 hours of your promotion. This concept typically only applies if you are running paid advertising like Facebook Ads, Adwords, or traditional media. I would only advise using this strategy if you have a good idea of what the average lifetime value of a customer is in your business. Meaning, how much money does the average customer spend with you in the first 12 months? If they spend $600 on average in their first year, would you be willing to pay $150 in advertising to acquire a customer? Heck yeah! This is exactly how many big authors and speakers give away their books for FREE (just pay shipping costs). They are absolutely 100% LOSING money on the book sale, but they know they will be profitable 30-60-90 days down the road. The free book is a loss leader for their business to acquire more customers and bring more people into their community. Giving your product away for free, or a free trial period, only makes sense if you know that your average customer will come back and purchase multiple times. This does not work for very all business models, and can actually do more damage than good. I am not a fan of free trials or giving things away for free. People do not value free beyond the moment they sign up. Free trials can end up creating a slew of customer support requests from “tire-kickers” who will never actually buy your product. So be very careful with free! Regarding all types of discounting, be very very carful not to discount your products and services too often. You do not want to set the expectation that any of your products or services will be on sale soon. When was the last time you saw a “Sale” sign out in front of the Apple store? (Never!). There are so many sales at Macy’s, I wont even go in there unless I have a 20% off coupon in my hand. Apple has trained me to value their products. Macy’s has trained me to wait for the sale. Operate your business more like Apple, than like Macy’s. As I mentioned at the beginning of this post, your irresistible offer will be most effective when you take several of these concepts and stack them together, to create an irresistible offer stack. There is no single correct combination of these concepts, and ultimately you will want to try and test a couple different combinations to see what drives the best results for your products and services. If you have any questions please reach out to us at Support@PersonalBrand.com. We’re here to help! If you’d like to stay up-to-date on the latest tools, strategies, and best practices for building your personal brand, be sure to join our private, Personal Brand Builders Community. It’s free… and awesome! We hope you enjoyed this article, thanks for reading! Follow us on Facebook, and Twitter for updates every time we publish! 7 Thought Leader Myths. Busted! Michael R. Hunter is the founder of PersonalBrand.com. 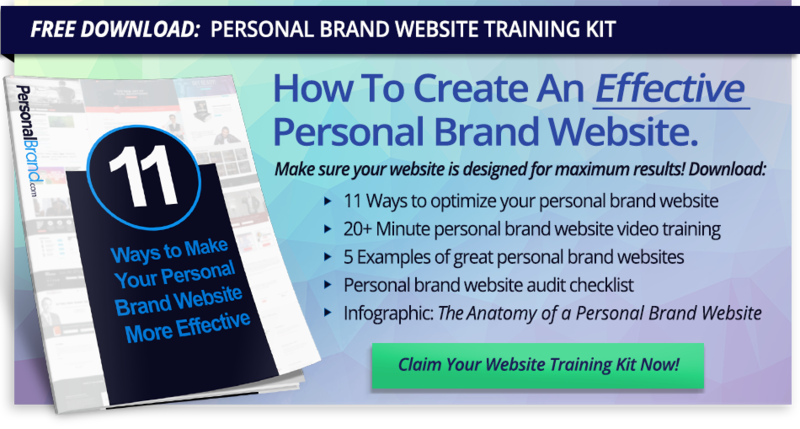 For the past decade, Michael has helped experts, entrepreneurs, and personal brands package, and sell their knowledge online. He’s worked with people like New York Times #1 Bestselling Author, Brendon Burchard, Business Icon & #1 NYT Bestselling Author, Harvey Mackay, Business Influencer, Mel Abraham, Brain and Celebrity Memory Expert, Jim Kwik, The Restaurant Boss, Ryan Gromfin, NFL Star & Broadway Actor, Bo Eason.